Way back in 2014, I wrote about a breakthrough resource for your content creation. “Finally, after years of clumsy, clunky automated tools for ‘spinning,’ scraping, regurgitating, and extruding low-quality content, we’ve found a solution. “This resource produces sharp, smart, audience-engaging content every time. Over time, it even calibrates itself to produce more effective headlines, to tailor content to the precise needs of your audience and customers, and to automatically generate semantically relevant alternative keyword phrases. 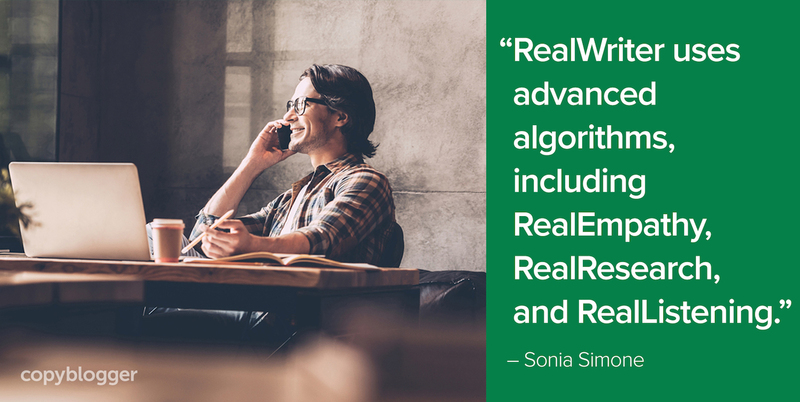 Spoiler alert: RealWriter isn’t a new app, and it’s not an enterprise platform. Why so snarky? Because at the time, I saw app after app being promoted to solve problems that are much more intelligently addressed by a real human being. Why revisit RealWriter in 2018? Surely as a culture, we’ve figured out that there are some things software is wonderful at, and some things that are better done by human beings who care about their craft. Right? Is your content failing to connect? How effective is machine-written content so far? It tends to look a lot like this. For very simple information, like sport scores, it’s probably fine. In some cases, I’m sure software-generated text is able to trick people into thinking it was created by a person. And the software will get somewhat better at doing that. But if you unleash that type of software on your content, what do you get? A whole bunch of content that sounds like everyone else’s software-written content. In other words, the last thing content marketing needs. As every science fiction fan knows, the only salvation in the robot-controlled future is our own weird, funky human unpredictability. The more work that robots do for us, the more refreshing it is to see something created by a person. “Human effort doesn’t scale” is one of the most common arguments organizations make when they’re looking to overly automate their content creation. Human effort scales just fine when it’s intelligently amplified by technology. Seth Godin doesn’t have to type more words to reach his legions of fans. He just uses technology to get his writing out to as many people who want to read and share it. The answer to “scale” isn’t to turn the crank harder, spewing out an ever-greater volume of Content Regurgitated as Product. That’s the precise kind of content that we need less of. The answer to “scale” is to use technology for what it’s good at. Getting a really good amplifier doesn’t mean you let the amp try to write the songs. Why do we show up every week, year in and year out? Because we adore actual writers. The human voice, with all of its peculiarities, variations, and imperfections. Captured in text, podcasts, video scripts, and all of the other expressions of individual human creativity. Everything we do is to support the real human writer. We’re not interested, at all, in rejecting technology. That would be like telling a songwriter in 2018 that the only way to find an audience is to be on the road 300 days a year. I mean … it can work, but there are less painful options that are worth a try. Use wise technology to amplify your message. Use smart segmentation, automation, and tools like chatbots to direct relevant, human-created messages to the right people, at exactly the right moment. Hope you can join us inside Creative Content Foundations! If you want to connect with some fellow real people creating interesting, original, human content, and doing that on the smartest possible foundation, we’d love to see you inside our new course, Creative Content Foundations. Our first group of students has been wonderfully enthusiastic and motivated. We close the doors to new students today, Wednesday, April 4 at 5:00 p.m. Pacific Time. That lets us really focus on this group of learners, so we can make sure the course truly meets their needs and moves them meaningfully toward their goals. Here’s where you can learn all about Creative Content Foundations 2018. Great piece. Uncommonly common-sensically written and explained. Like 99 percent of everything I’ve ever read on Copyblogger.